It's for sale. One size fits all. Never worn (no sh*t) with tags. Quick, make an offer before my dad sees it. I'm intrigued---can we have a different angle? Are there sleeves, or is it actually a cape? I must admit never having seen anything like this (that is, I've seen capes, death heads, and crest patches, but never together). Wow. It looks like a teacher's cape from Hogwarts. Without magic spells to help me I don't think I could wear it. Maybe in New York. Whisky Tango Foxtrot indeed. Were thinking of joing a dueling club or the neo-SS or something? Great cape! Need some custom shirts or some of the best ties in town? this is, almost certainly, an old oddfellows or other fraternal organization costume...i'd have to look thru my catalogs to find what/which costume it was part of. looks like someone added the patch, tho. 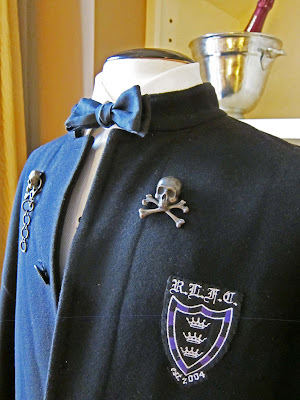 Ralph Lauren's vers of Yale's Skull & Bones.... To Deer Island, Bonesmen! Anon- No sleeves. Button front. Couple pockets on the inside. From RL Rugby. M Lane- I think there's an attorney in NYC who wears a cape. 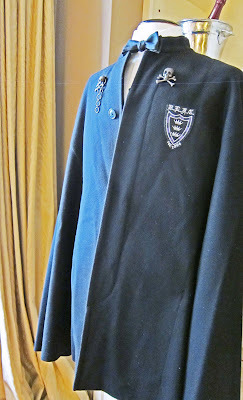 Scott- The Marine dress uniform is stunning in pictures but like the Navy there's a lotta poly and esther in them woods. Mr Grey 4 - Always. Stew- Let me make one thing clear. I've never worn it. Never. Robin- It's RL Rugby but good guess. Stew- Yep. You have one? Preppy Pauper- Hey, I'll cut you a deal. This will kill 'em Canada. 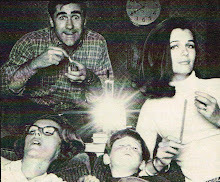 I've got close relatives who wandered into the House that is Bone; the others stayed true to the Crimson. Blood is thicker than univeristy rankings sometimes. Those exact members of the alphabet went through my mind. If you're serious about selling it, let me know. It's my birthday Thursday, and as I kiss adolescence away I want to treat myself well. Dale - PM me. You sure you know what you're doin? NOT on your life...But I have been curious about Malaki's cape... Tell me, do I have to be the president of a middle eastern country to pull it off properly? The Cape has left the building. Off to a man of style who owns two -count em- two Morning Coats.